Rarely, serious (sometimes fatal) asthma-related breathing problems may occur in people with asthma who are treated with drugs similar to formoterol (long-acting beta agonists). 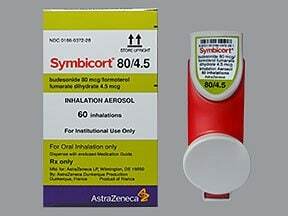 In people with asthma, this product should only be used when one long-term medication (such as inhaled corticosteroids) does not control breathing problems. Before using this medication, it is important to learn how to use it properly. Discuss the risks and benefits of this medication with your doctor. Who should not take Symbicort HFA Aerosol With Adapter? 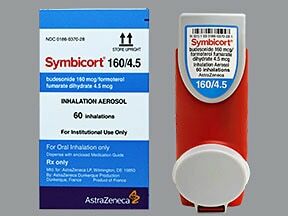 Do not use this medication with other long-acting inhaled beta agonists (such as arformoterol) because doing so may increase your risk for side effects. Read the Medication Guide provided by your pharmacist before you start using this medication and each time you get a refill. Read the patient instructions for directions onhow to use this inhaler properly. If you have any questions, ask your doctor or pharmacist. Use this medication regularly in order to get the most benefit from it. This medication works best if used at evenly spaced intervals. To help you remember, use it at the same times each day. Do not increase your dose, use this medication more frequently, or stop using it without first consulting your doctor. Also, do not use other long-acting beta agonists while using this medication. What conditions does Symbicort HFA Aerosol With Adapter treat? Get medical help right away if any of these rare but seriouschest pain, fast/slow/irregular heartbeat, severe dizziness, fainting, seizures. A very serious allergic reaction to this product is rare. However, get medical help right away if you notice any symptoms of a serious allergic reaction, including: rash, itching/swelling (especially of the face/tongue/throat), severe dizziness, sudden trouble breathing. List Symbicort HFA Aerosol With Adapter side effects by likelihood and severity. Before using this medication, tell your doctor or pharmacist your medical history, especially of: current/past infections (such as tuberculosis, herpes), high blood pressure, heart disease (such as chest pain, heart attack, irregular heartbeat), overactive thyroid (hyperthyroidism), seizures, bone loss (osteoporosis), eye problems (such as cataracts, glaucoma), diabetes, liver disease, swelling of an artery (aneurysm), a certain tumor of the adrenal gland (pheochromocytoma). What should I know regarding pregnancy, nursing and administering Symbicort HFA Aerosol With Adapter to children or the elderly? Some products that may interact with this drug include: aldesleukin, mifepristone. 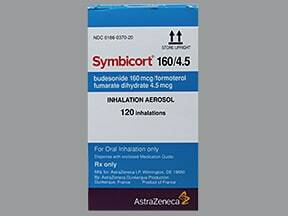 Does Symbicort HFA Aerosol With Adapter interact with other medications? Are you taking Symbicort HFA Aerosol With Adapter? Are you considering switching to Symbicort HFA Aerosol With Adapter? How long have you been taking Symbicort HFA Aerosol With Adapter?